I just got back last night. The boys and I are so glad to be home! While I was in Florida I finished up "Land of the Free." 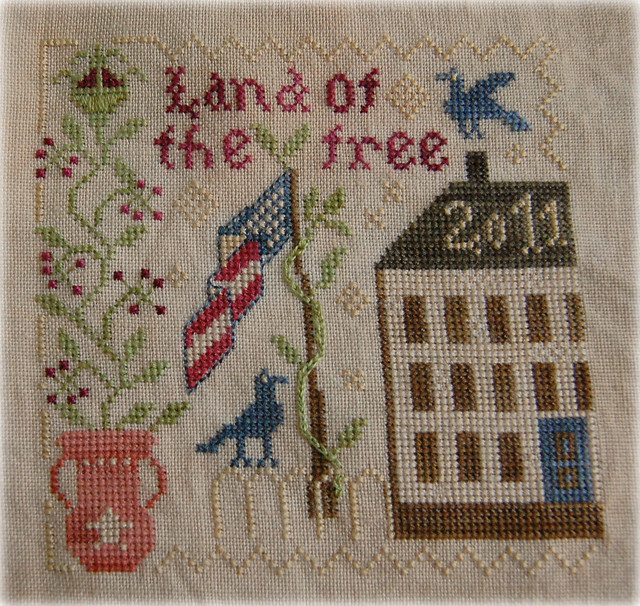 Blackbird Designs "Land of the Free"
This design is only 4" x 4" on 40 ct, so it stitched up pretty quick. 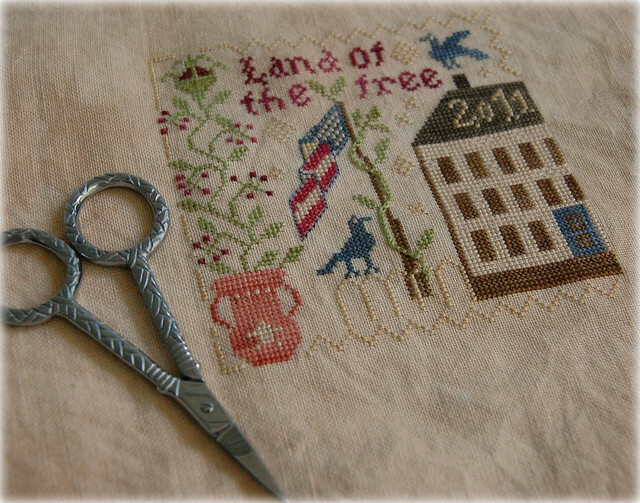 I'm in a patriotic stitching mood - I was thinking of stitching this little fob next. That is just wonderful, Nicole. I really love it! Glad you're home now! The colours just pop! This is lovely! This design is so nice! How will you finish it off? Very beautiful finish Nicole. Love that darling fob too. It will look fantastic as well. Great finish! I love finishes on 40 count. They look so dainty afterwards. I just bought the magazines with that BBD design. I love how yours turned out ! I like the Liberty Scissor Fob you have lined up for your next project !! Happy Stitching! Lovely finish. Hope you had a good holiday. Too sweet!!! I love it. Congrats on your sweet finish Nicole. Very pretty finish! I just found the magazine with this pattern and I'm looking forward to stitching it myself. You are definitely inspiring me! Very nice finish! love the colors in this piece, they really stand out nice. Love the chain stitch and the back-stitching on the flag! Welcome home! Happy Weekend to your family, together again! That's so sweet - just picked up my Magazine yesterday - for this! I love it. The colors are beautiful. I love BBD!!! Welcome home! What a lovely finish! Welcome home! Land of the Free turned out wonderfully! Great finish Nicole and welcome home! This one turned out really pretty! I love the colors this time of your on patriotic samplers and this one is gorgeous as is your stitching! I just need to get back into some of this soon. Great piece! It's so nice that you'll be able to enjoy it on the 4th. I would love your conversions.